"Spectacular views across estate parkland from the bedroom window"
Y Stabl self catering holiday cottage will appeal to romantics, with its log fire, four poster bed and fairytale streamside setting. Its elegant Georgian facade overlooks a courtyard fringed by giant beech trees and parkland. 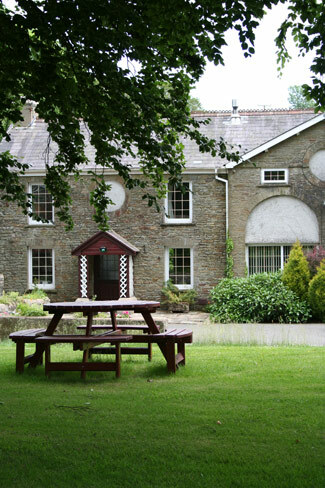 This five star accommodation was originally built to house the horses and carriages that carried the landed gentry to and from the Plas Cilybebyll estate. Free WiFi network works inside cottage and on lawns. Those who have discovered this charming Georgian coach house spend many happy days exploring the private countryside that surrounds this exceptional self catering cottage. Sit beneath the canopy of the giant beeches on the courtyard lawn to enjoy wonderful sunsets over the sheep grazed parkland (the lambs love to play in the evenings). Relax in the private back garden, listening to birdsong and the delightful sounds of the babbling brook which is home to wild trout, dippers and grey wagtails. A little gate and steps lead down into the stream if you fancy a paddle! If you fancy a walk, follow the waymarkers from your cottage, along the river and into a beautiful oak woodland. Unlike many self catering cottages, Y Stabl comes with over a hundred acres of private countryside. Again to South Wales and to Y Stabl. My 3rd trip “ Y Stabl is such a gem – the surroundings, the location, one can explore so easily from museums, to castles to small villages or one can simply sit and enjoy the birds and the brook. I leave with much more than I came with. I shall come again. Julie, USA. Welsh Poppies growing wild out of the wall of Y Stabl self catering holiday cottage. As you enter Y Stabl, you step into a beautiful farmhouse-style kitchen which looks out onto the back garden. The kitchen is well equipped with basics such as tea, coffee and milk. The oven and hob are electric. There is a fridge, washer/dryer and dishwasher. The dining table is oak and the worktops granite. The lounge is roomy and cosy with a door that opens to the back garden, enclosed by a picket fence and sitting on the bank of a beautiful mountain stream. The graden has a family-sized picnic table. This area is a real highlight of the accommodation – the banks of the stream are beautiful with bluebells, daffodils, hazel trees and rhododendrons all growing wild. You may spot wild trout in the stream and the heron sometimes pays a visit! The lounge is cosy with wooden flooring, a comfortable sofa and woodburning stove. A complimentary basket of chopped wood is provided. The famous information folder lives in the lounge and it’s a great place to plan your daytrips with a little help from our suggested itinereries – there is so much to see in South Wales. The downstairs toilet is in the corner of the hallway. An ironing board may be found beneath the stairs. Historic images of the estate in days gone by adorn the stairwell. At the top of the stairs a window overlooks the stream – it’s a great spot to watch for wild trout leaping out of the water. To the right is the bathroom which has a bath and over-bath shower. There are two bedrooms upstairs. The twin room has exposed beams and looks out at the courtyard lawn. The master bedroom has a romantic four-poster bed, exposed beams and has views of the old walled garden of the estate and the Plas Cilybebyll mansion house. The room is filled with light from an overhead skylight. Full viewing equipment is there for your enjoyment with flat screen HDTV, Freesat, DVD player, broadband, radio/CD player, plus a stock of DVDs,and a selection of books, maps to borrow, cards and games. Y Stabl, Cilybebyll, provides self catering holiday accommodation near Pontardawe and Neath. In the peaceful grounds of Plas Farm, approached through splendid parkland, this former Georgian coach house has its own garden flanked by a babbling mountain stream. Stunning countryside and walks from doorstep. Brecon Beacons National Park and Gower Peninsula close by. Golf course within 2 miles. Sea 30 minutes’ drive. Shop 1 mile. Y Stabl, is perfect for a romantic break in Wales. The well equipped kitchen was once a saddle room. The cosy lounge was where the carriage horses slept. Their iron stalls were large and ornate. A pair of chestnut carriage horses called William (7 years) and John (6 years) lived there in 1914. The twin bedroom was the groom’s quarters. The hallway was once where the carriages were parked. In 1914 a sale was held at the farm. Among the items were a wagonette to carry 8 with a detachable hood by Fuller of Bath, a carriage foot warmer, a four wheel dog cart by Vezey of Bath, a Governess cart and a Brougham by Phillips of Neath for a single or pair. All these items would have at one time been housed in what we now call Y Stabl self catering holiday cottage.